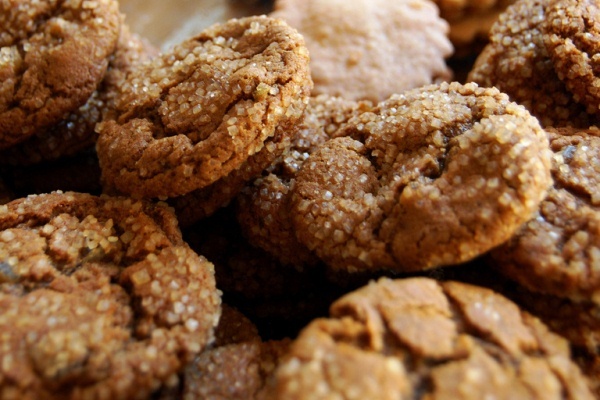 Ginger is such a neat flavor that really shouldn’t be confined to the holiday season; this gingersnaps recipe is spicy, sweet, chewy, and all-around deliciously comforting. Read the original post here. Center an oven rack and preheat the oven to 350°F. Line two baking sheets with parchment paper. In a medium bowl combine the flour, baking soda, ginger, cinnamon, allspice, and salt and whisk to combine. In a large bowl combine the warm butter, molasses, both sugars, fresh ginger, and the egg and mix thoroughly. Add the flour mixture and chopped candied ginger and stir until incorporated. The dough will be soft. Form the dough into 1-inch balls. Roll the balls in turbinado sugar and place them 2 inches apart on the baking sheet. Bake for 10 to 12 minutes, or until the cookies puff up and crack on the surface and then begin to deflate in the oven. For chewier cookies, remove them from the oven when at least half or more of the cookies have begun to deflate; for crunchier edges with chewy centers, bake a minute or so longer. Slide the parchment sheets of cookies onto cooling racks or use an offset spatula to transfer the cookies, and cool completely. Stored in an airtight container, gingersnaps keep for several days.